We were only carrying our rifle and a duffle bag with our personal belongings. Our equipment was waiting for us over there. Our Commanding General was Major General Edwin Burba. General Burba ordered the entire 2nd Armored Division (15,000 + troops) gathered in the rear of Fort Hood one Saturday morning for �the Sermon on the Mound�. He impressed on everyone that we were representing the United States and would need to behave and be careful�. 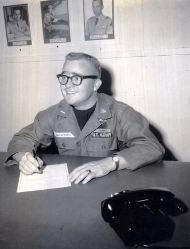 As a Second Lieutenant, I was called to active duty with the US Army in March 1963. I felt homesick as I said goodbye to my parents in the backyard of the Old Homeplace on March 30, 1963. 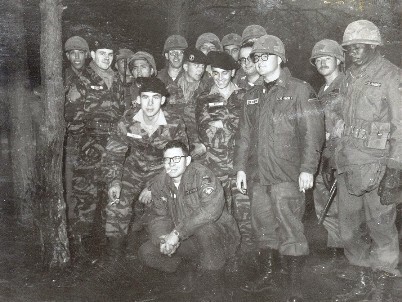 After training at the Adjutant General School at Fort Benjamin Harrison, IN, I was assigned to Headquarters Company, 2nd Armored Division at Fort Hood, Texas. 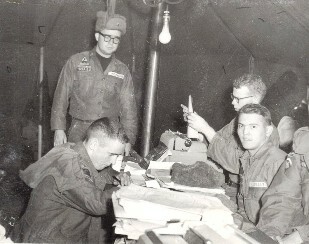 I arrived at Fort Hood in late June 1963. 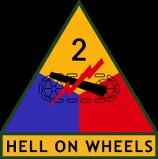 The Second Armored Division had been commanded by General George Patton during WW II and was known as “Hell on Wheels”. That was on our official army patch identifying our unit. General Patton wore the patch over his heart rather than on his arm. Because of that history, 2nd AD personnel were allowed to wear the patch on the front of the uniform. It was the only Army Division authorized to do so. 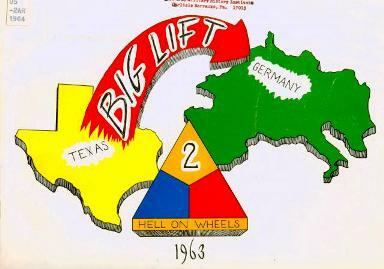 I was soon to learn that I would be a participant in an historic deployment of the entire Second Armored Division (15,000 + Troops) from Fort Hood to Kaiserslautern, Germany in the Fall. My initial assignment was to be the officer in charge of Personnel Services Division Team 5 to service battalions of the Second Armored Division. 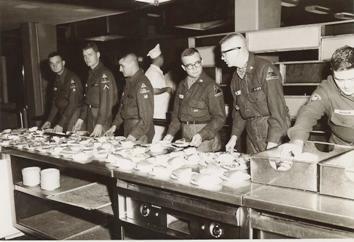 There I became friends with several other lieutenants, NCO’s and enlisted personnel from around the country. One Lt friend worked in Intelligence. 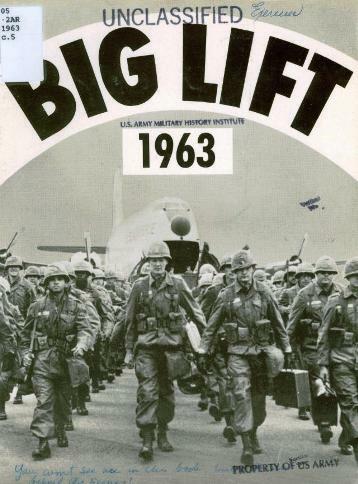 Operation Big Lift was a secret planned operation for the Fall of 1963. 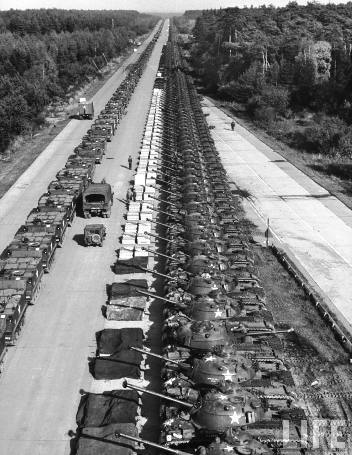 The plan was to fly the entire 2nd Armored Division to Germany within 72 hours. A lot of work and planning went into the operation. As we prepared for the long flight, we were only carrying our rifle and a duffle bag with our personal belongings. Our equipment was waiting for us over there. Our Commanding General was Major General Edwin Burba SR. General Burba ordered the entire 2nd Armored Division (15,000 + troops) gathered in the rear of Fort Hood one Saturday morning for ‘the Sermon on the Mound”. He impressed on everyone that we were representing the United States and would need to behave and be careful. He said ‘be careful with the farmer’s daughter”. He also gathered the officers and noncoms for a briefing in the Ft Hood Stadium. A picture of that appeared in Life Magazine. It was an unusual scene of a lot of Stripes and Metal. It was a historic moment that was publicized at the time in Life, Time etc. 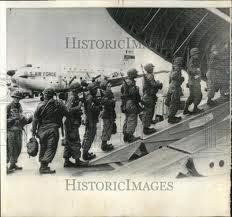 On October 22, 1963, we gathered our footlocker, duffle bags and rifles and road in a truck to Killeen Air Base to board cargo planes. The trip was to take over 24 hours with us sleeping on a hammock or floor. We stopped for a meal and fuel at Goose Bay Labrador and again at Londonderry England. 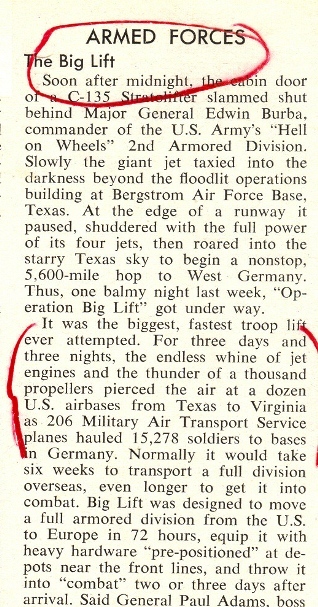 We finally landed at Ramstein Air Force Base and were trucked to our duty stations near Kaiserslautern. The Germans were very protective of their forests and trees. 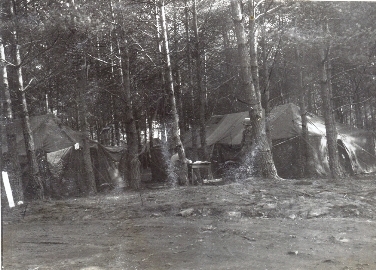 We were encamped in the woods and were housed in tents and used outdoor dug latrines. We were definitely “in the Army”. 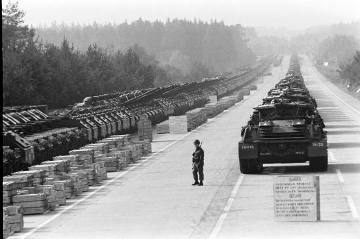 As we rode to our site, I remember endless rows of tanks, trucks and other Army equipment as far as the eye could see. 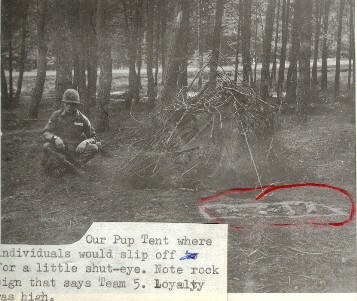 We were to spend three weeks in tents and exercises as we participated in war games with the 3rd Armored Division. Once, I accompanied another officer on a courier run in a jeep and remember seeing the town buildings that showed signs of damage done during W W II. To me, as a 23 year old man, the War then seemed long ago. However, with the aid of hindsight, I came to realize it had only been 18 years since the war ended. I remember riding trolley cars with many soldiers on passes riding among German civilians. Even then, I sensed some resentment of the American Soldier. I was chosen to be part of the Rear Detachment that remained an additional three weeks “mopping up”. Brigadier General Stafford was the commander and Captain Ben Duhon was my immediate supervising officer. Duhon was a Cajun from near Baton Rouge and he was ‘all military’. We got along and he gave me one of the highest ratings ever given in that unit on my Officer Efficiency Report. He and others recommended and encouraged me to go Regular Army and make a career of it. However, the idea to transferring or moving every two years did not appeal to this old Oconee County Native Country boy who liked “Home”.